Quality janitorial brooms pay themselves back 1000 times over time. A good broom will last you a long time so you don't have to keep buying them over and over and over as part of your standard janitorial purchases. We stock many different kinds of brooms to help restaurant and foodservice companies clean every part of their establishment. Angle brooms are very ergonomic for under tables while push brooms are used in warehouses for bulk sweeping. 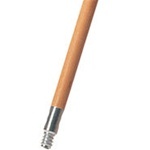 Continental Tapered Wood Handle - 60 in. 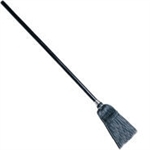 RCP 2536 Black Lobby Pro Broom - Synthetic Fill - 7 in. x 37.5 in. 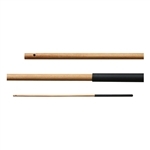 Threaded Tip Lacquered Wood Handle - 60 in. 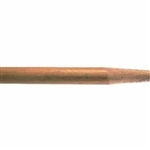 Tapered Tip Wood Handle - 60 in. Quick Connect Steel Yellow Handle - 52 in. Hygen Quick Connect Yellow Handle - 58 in. restaurant supply experts to not only provide you with your foodservice items, but your janitorial items as well to clean your business or home. Corn brooms are small and lightweight to keep in lobbies and cafe areas.